The Bielefeld Stadtbahn is part of the transportation system that serves the German city of Bielefeld. It is a commuter rail system that leverages the old network of trams and added underground sections in the city center, making this system a hybrid between a network of tram and subway. Bielefeld is a medium size city, between Hanover and Dortmund. Its transport system is much like its neighboring cities: Stuttgart, Cologne, Hanover, … The system has 7 underground stations. First one opened in 1971, Beckhausstraße station. Later the Jahnplatz and Hauptbahnhof stations, Wittekindstraße, Nordpark, Babenhausen Süd. Hauptbahnhof, Siegfriedplatz and Rudolf-Oetker-Halle. The Bielefeld Stadtbahn has four lines that connect in the city center in Hauptbahnhof, Jahnplatz and City Hall. It has a total length of 35kms and 62 stations, only 7 of them underground. Passengers: 32 millions of passengers per year. Stations: 62 stations, of which eight are underground stations. Line 1: It is identified by the color blue; it goes from Schildesche to Senne and back, with stops in Hauptbahnhof, Jahnplatz, Bethel and Brackwede. Line 2: It is identified by the color green; it goes from Milse to Sieker and back, with stops in Baumheide, Hauptbahnhof and Jahnplatz. Line 3: It is identified by the color yellow; it goes from Babenhausen Sud to Stieghorst Zentrum and back, with stops in Hauptbahnhof, Jahnplatz and Sieker Mitte. 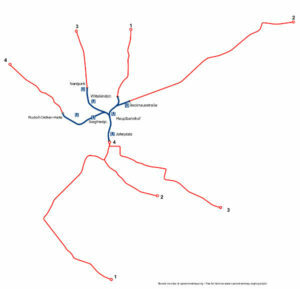 Line 4: It is identified by the color red; it goes from Lohmannshof to Rethaus and back wit stops in Universität, Hauptbahnhof and Jahnplatz. The Stanbahn run until 1 a.m. every day and the service starts at 4:30 a.m. It starts at 8:30 a.m. on Sundays and public holidays. Trains stop every 5 – 10 minutes during the day and every 15 minutes late night. There are night-buses running the rail routes hourly so, just in weekends, there is a 24-hour-service. The Stadtbahn Bielefeld several zones including other cities but city of Bielefeld is all in tariff zone 1. You just have to take into account tariff zones when going out of town. Single Ticket – 1.70 €. Einzelticket: You can travel where you want, how you want, changing as many times you need within the first 90 minutes from ticket validation. Short ticket (Kurz). You can travel a distance of 4 stops in one direction. 9-Uhr-Tagesticket (5 people) – 6.50 €. Valid for 5 people traveling together, for a full day starting at 9am. Tickets can be purchased at automatic vending machines in almost every station except weekly / monthly bonuses ( atms accept bills of 5 and 10 € and also cards). Other tickets. You can get all the information on the website of Mobiel. Special Ticket for children between 6 and 14 years old. There are some beautiful architectural features in Hauptbahnhof (central) station.